I have to admit that if I was reading the Bible for the first time, I wouldn’t stop on the Last Supper and the Communion scene and think, “This is something we should do now, all the time, together.” It’s a ritualized act now, a thing that almost all churches will do at one point or another throughout the year, regardless of means or denominational affiliation. But in some ways, it strikes me as arbitrary. 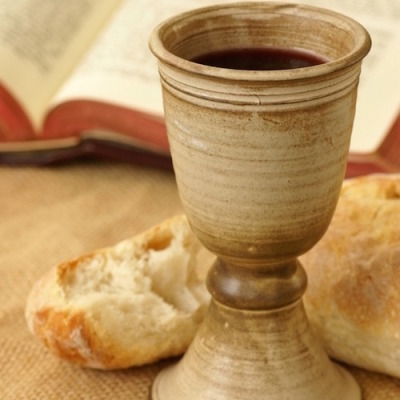 Jesus gives the disciples His blood in the form of wine and His body in the form of bread, which is already a little strange — our Savior wants us to ingest Him? — and besides, doesn’t constitute a full meal. He tells His disciples “this do in remembrance of me,” but doesn’t add “And do this every Sunday after the sermon has ended,” or “Now go and do this the third Sunday of every month and at special worship services.” He does it, and then it’s over. There are more important things to do now, like dying. But the church has held onto this, calling it a sacrament. "Sacrament" comes from the Latin word “sacer.” “Sacer” means "sacred," which is unsatisfactory, defining the word with reference to itself. An online at-home tutorial from something called International Catholic University goes a bit further, saying "Sacramentum in Latin translates the Greek mysterion (mystery), which we find in Ephesians 5:32 and many other places." Ephesians 5:32 has Paul talking about marriage — another sacrament — when he says, "This is a great mystery, and I am applying it to Christ and the church." Mystery has never sat so well with me, and it strikes me now that part of the reason I didn't understand things like Communion or baptism was because I didn't want much to do with mystery. I was, in many ways, a typical oldest child who preferred order to chaos, pen to pencil, certainty to unknowing. And although I wouldn't have been able to put my finger on it then, our church tradition often defined itself by what it wasn’t — such as Catholic. We thought we offered a much-needed corrective to what we perceived as a doctrine of works and Sunday-only Christianity. No one came out and said it that way, thankfully, but the sentiment was there. Regrettably, in high school, we were encouraged to bring our Catholic friends to youth group and had conversations about questions like, "Are Catholics really Christians?" The word "sacrament" wasn't in our vocabulary. "Mystery" was a little closer. If anxiety — which could be defined as a temperamental preference for certainty over mystery — leads to a withdrawal from the world, the Eucharist does the opposite. When at my most anxious, I want to hide, to leave what I know behind and keep to myself for as long as possible. But the Eucharist is an act that not only requires other people — someone to serve, someone to be served — it is also the kind of act that can reunite an anxious person with her body. Friday nights in high school always found our group of friends at someone’s house. One wintery Friday night, we were at Randi's house, and we started talking about Communion. We all went to the same church, the church where my parents worked and the place that was very much a second home to all of us. Our high schools were scattered throughout the northwest suburbs of Chicago, but we were bound together in feeling more at home with each other than with our peers at school. We had heard earlier in the week from Shane Claiborne, a dreadlocked Southerner whose religious convictions had taken him to live in a rundown house in Philadelphia with his organization, the Simple Way. He talked about the importance of simplicity in spiritual practices. So on that Friday night at Randi's house, we decided we would take Communion. Her family had a loaf of Wonder Bread in the freezer and some Ruffles in the pantry. Even though frozen bread seemed wrong, potato chips felt categorically incorrect for Communion. So we broke the bread into chunks, poured grape juice into plastic cups, and like guests at some kind of holy party, indulged in the sacraments. This radical Christian stuff felt different, and we were on the edge of so much possibility that it felt like this might just be the thing to crack the whole world open. The body, the blood, broken and shed right here in this suburban Illinois basement. The egress windows didn't let any more light in; the sun had gone down, and while our more socially adept peers drank cold beer by the bottleful, we accepted the sacrifice of the grape juice. The blood of the Lamb of God, poured out for us from this Welch's bottle into these picnic cups, making this basement a holy place, making us a holy people. We craved that holiness with a kind of purity set aside for teenagers. We didn't totally understand what Communion was. At least I didn’t. If it was magical to the Catholics, literally becoming body, and blood, and meaningless to atheists, a bizarre religious ritual, I suppose I fell somewhere in between. We read no books about Communion, took no classes to prepare, made no declarations of faith besides the act itself. Now I see the act is its own declaration, its own remembrance. But I didn't know then. I’ve taken several different kinds of Communion throughout my life: the kind handed out to rows of people in surprisingly light silver dishes, the kind where you dip the bread into the wine, the kind where you eat the bread and then tip the shared wine glass to your lips. That last one bothered me at first. I would worry about germs on the rim, about spilling wine down the front of my clothes, about drinking too much or not enough. A few times I didn’t get any wine when the priest tilted the chalice to my mouth, and what’s the etiquette then? Do I grab the priest by his chasuble and ask him to come back? Pretend like I got my sip of wine? Mostly I thought about everything but the act of communing with God. I was glad when I saw that the church my husband and I now attend served Communion by the plastic cup and individual wafer. Instead of passing it down the row, we all walk, pew by pew, to the front of the sanctuary. “The body of Christ, broken for you,” the person behind the bread tray says. “The blood of Christ, shed for you,” the person holding the cups says. We walk with the body and blood in our hands back to our pews and wait, wait for the song to finish, wait for everyone, even the Communion servers, to be served, and then we eat and drink together. The body of Christ at this church is a small wafer that dissolves on the tongue if you let it sit long enough. On either side is scored a cross, although it can also look like an “X” if you turn it the right way. The ritual now is that I hand my husband the cup afterwards, and he puts it inside of his, and then tucks them both into the holder in the pew in front of us. The wine is port wine, no special brand — I know this because I work at the church — and Sundays are the only days I chase wine with coffee. I like the strength of the wine, though, because it feels appropriate. Communion should be a shocking thing. I was eighteen when I got my first tattoo, the Hebrew word for “mystery,” just below my right ankle. The word is small, maybe two inches long, and it looks like it says “719’0.” I don’t know how to pronounce the word — it rattled around in my head for a few months after I got the tattoo, but now it’s gone. It makes no sense to have the word in Hebrew, because the word I was inspired by — mysterion — was Greek. But I preferred the look of the Hebrew, so I found the word closest to it in a book in the stacks of my college library. I went to downtown Santa Barbara to buy a pad of tracing paper and carefully recreated the lines of each letter at a table in the back of the library’s second story. The pain wasn’t as bad as I thought it would be, although the itching was worse. Mom and Johnny and I walked from the tattoo shop to Angel’s Gate Park with a view of the Pacific Ocean and Catalina Island beyond. Tattoos aren’t a sacrament. They’re not even a mystery — the needle, dipped in ink, drills into the skin and deposits the ink underneath your epidermis in the design and area you’ve chosen. In fact, they’re as predictable and controllable as anything I can think of. I often forget that I have a tattoo at all. I am twenty-nine now, and for eleven years I’ve caught sight of my ankle and made the startling discovery that there is, in fact, something there. I haven’t participated in a basement Communion in quite some time. There were a couple of similar experiences in college, but I traded Friday prayer nights for Friday nights dancing or time at the beach or at the house of a friend. The spontaneity of a basement Communion is not attractive to me in the way it once was. My understanding of Communion is different. But sometimes, nostalgic as I am, I want dearly to smell the must of Randi’s basement and sip grape juice and hold that moment as holy as anything that has ever existed in the world and will exist in the future. I want to look into the eyes of every person sharing the blood and the body in the same room as me, to know them in the burning fire of our young spirits. It’s not that I’ve grown out of a certain kind of theology so much as I’ve grown into actually giving thought to things like Communion and baptism and believe them best placed in times when they have had consideration given them. Camp lake baptisms and basement Communion happen mostly to teenagers for a reason. I didn’t tattoo that word on my body myself. Someone else had to do it for me. Is it a stretch to say that, to compare it to communion or marriage or baptism? I don’t know. There’s a lot I don’t know. I just know that I don’t know it now. Laura Turner is a writer and editor living in San Francisco.